Picture The World’s End as a bittersweet layer cake, a film about the double-edged sword of growing up that also serves as the capstone offering in Edgar Wright’s Three Flavours Cornetto trilogy. Have nine years really passed since Wright, along with his go-to leading men, Simon Pegg and Nick Frost, vaulted into national prominence with Shaun of the Dead, a movie that furthered his iconography amongst his established base of Spaced fans and introduced him to an even wider audience of genre aficionados and film geeks? I can recall the dreary college day when my friends gathered into my cramped dorm room to watch Shaun on a now-ancient region-free DVD player, but that feels like more than an age ago. Which may be part of Wright’s point. We’ve spent near-on a decade watching the Cornetto films, from 2004’s Shaun, to 2007’s Hot Fuzz, and now The World’s End; they’re not-so-loosely bound together by common interests and motifs, with the presence of that eponymous frozen treat, a love for B-movies, and the bonds of friendship chief among them. In that span of time, we’ve seen Wright’s kinetic repertoire of cinematic tricks expand, and we’ve seen Pegg and Frost grow as individuals and as a pair of real-life amigos. (Not to exclude Wright from that camaraderie, of course.) What The World’s End represents, then, is a fond, wistful farewell to their partnership (at least in the meanwhile), a last hurrah for one of the day’s great movie trios. That sense of parting ways feels incredibly, appropriately in-line with the story they tell here. Returning to the type of small-town backdrop used to such great effect in Fuzz, The World’s End revolves around a reunion between childhood chums twenty years after an ill-fated attempt at conquering the Golden Mile, a grueling pub crawl through Newton Haven clocking in at twelve pints a person; the group’s leader, Gary King (Pegg), sounds a call to arms and rounds up Andy Knightley (Frost), Stephen Prince (Paddy Considine), Oliver Chamberlain (Martin Freeman), and Peter Page (Eddie Marsan) for a second go-round. As the saying goes, though, you can never go home, especially when home has been taken over by an invading force of conformist, gratingly authoritarian alien automatons. So, yes, the boys face a more tangible predicament than most of us do when we revisit our old stomping grounds, though The World’s End gets existential enough that we can identify with its spirit if not its robot swarms. Like its movie siblings, the picture is all about growing up, but Gary’s case of stunted adolescence proves a bit more severe than, say, Shaun’s. Whereas Shaun had to grow up and be a man, Gary just has to grow up. He’s hooked into the past, unable to move forward from that glorious evening of drink and debauchery and segue into adulthood. Not that The World’s End illustrates adulthood as something worth embracing, mind; middle age hasn’t been completely kind to the other four members of the five Musketeers (Gary’s not the well-read sort), rendering them soulless, straight-laced, lovelorn, and boring in turn. Pegg and Frost swap places here, with the latter playing the straight man as the former goes full-looney. We get why the gang gravitated toward Gary in the first place; he’s a never-ending party, an endless font of vita and verve, which also handily illustrates why he’s such a drag past a certain age. Watching him make a fool of himself feels exhausting, a quality that speaks to Pegg’s credit as a performer, and his endless arsenal of seemingly improvised speeches wears out everyone’s patience for him with breathtaking alacrity. Underneath all of that, though, there’s more to Gary, as there always is with Wright’s heroes, and as the intoxicated clique barrels forward toward their end goal, “more” comes bubbling to the surface. That’s the common pattern with these films: pick a genre, make an honest-to-goodness entry in the chosen tradition, blend it with laughter, and cap it off with big moments of personal, emotional catharsis. In this way, The World’s End plays quite the same as Shaun and Fuzz, but its individual pleasures – Wright is no automaton – are all its own. Wright doesn’t need to prove he can orchestrate an action scene, yet every barroom brawl or foot chase choreographed here shines with startling precision, thanks in no small part to the efforts of Brad Allan, accomplished fight coordinator and leader of the Jackie Chan Stunt Team. (He also happens to have worked on Wright’s Scott Pilgrim vs the World.) His craft, too, feels sharper than ever, his slick cinematography and crisp editing blending to create his sharpest visuals yet. His actors operate on a higher level of performance alongside him. 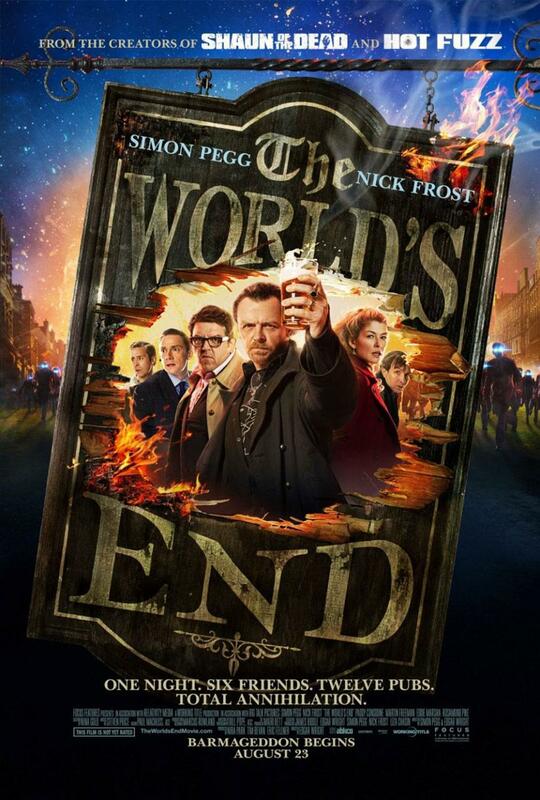 Pegg and Frost could well be the best (or at least most purely watchable) screen duo of the day, and The World’s End re-contextualizes their bickering and their reconcile from a vantage point of experience; they’re great, and Frost can claim this as his best effort to date. To not give the supporting cast their due would, of course, be a mistake, since they each play their parts and seamlessly merge with Pegg’s and Frost’s company (which eventually comes to include Rosamund Pike, quietly funny and adept at swinging a bar stool). They belong, which is essential, as they’re ever-so-slightly more of a presence here than the secondaries in Shaun and Fuzz, though it’s hard to quantify that statement if only because the background players are almost as important to the success of those films as their stars. All the while, Wright uses The World’s End as his own personal update on the Arthurian quest tale – the character surnames aren’t coincidental – and as a comment on cultural homogenization. In that regard, the film plays with shades of grey; being free doesn’t seem like the big, screaming deal Gary argues it to be (though as the film notes, there’s no arguing with him in the first place), but when every bar in town shares the same arrangements, the same decoration, and the same, lone brand of beer, maybe we should give pause to the idea of being adjusted. Shouldn’t we? There are questions raised here about middle age and the responsibilities of pushing forty, but what echoes most is the fear of losing one’s identity. So thoughtful of Wright, Pegg, and Frost to leave us with something to chew over. Cheers Angie. Yeah, definitely head to the nearest theater to check it out once it arrives your area – and watch it with your friends. Great crowd flick. Oh I completely agree with this review, wonderful film. I hope they decide to do another. Saw this the weekend it came out and I agree about the actors and their performances. This is a movie you see with a crowded audience and just have a good time with. Andy Crump - andrew@goseetalk.com Copyright @ 2009. A Constant Visual Feast. All rights reserved.